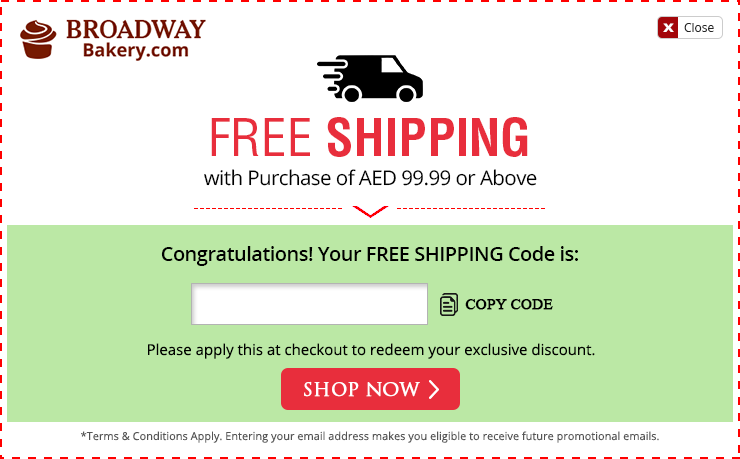 All products on Broadwaybakery.com are either delivered via Broadwaybakery.com’s own courier vans, or through FEDEX. Every necessary measure is taken to ensure that the product arrives to the recipient in pristine condition. If a product is damaged upon arrival, please contact a customer service representative immediately for assistance. For same-day delivery after these hours, call customer care or click "Live Help" for immediate assistance. Our office is open 7 days a Week from 8AM - 12AM Gulf Standard Time. We are able to process your order (i) Online, (ii) Over Live Chat, and (iii) By Phone. (i) Online - Once you have selected the item, please click on Order Now and proceed to Secure Checkout. (ii) By Phone - Please call us (UAE): (04) 224 8800 during our office hours (8AM - 12AM GST Daily) and we will be glad to place the order for you. (iii) Over Live Chat - Please contact customer service by clicking on "Live Help" during our office hours (8AM - 12AM GST Daily) and we will be glad to place the order for you. All credit card information is processed securely using GeoTrust’s SSL certificates, which follow world-class standards in online credit card protection. Because the credit card information is collected and processed on the secure servers of a large national bank, customers can rest assured that their credit card information will not be mishandled. Why did Broadwaybakery.com decide to go online? Broadwaybakery.com has a 256-bit SSL encryption and is McAfee Secure certified. This is the same level of security you’ll enjoy with most online banks. Rest assured, your personal information is completely secure when you purchase online from Broadwaybakery.com. Orders can be cancelled for a full refund if the cancellation is requested 24 hours in advance of the delivery date. If an order has been shipped, shipping fees are non-refundable. In the case of perishables such as bakery, chocolate, fruit, etc. : 50% of the product purchased is also non-refundable. The credit card statements will show the charge as "IAK International LLC". If the order is placed before 7pm, it can be delivered on the same-day. If an order is placed after 7pm, it can be delivered as early as the next day. If the order is placed before 1pm, it can be delivered on the same-day. If an order is placed after 1pm, it can be delivered as early as the next day. Al Ain deliveries are only available during Mondays between 10AM to 6PM. If the order is placed before 8am on a Monday, it can be delivered the same-day. And if the order is placed after 8am, it can be delivered as early as the next Monday. Yes! For Dubai: same-day delivery is available if the order is received before 7pm. For Sharjah: same-day delivery is available if the order is received before 4pm. For Abu Dhabi: same-day delivery is available if the order is received before 1pm. For Ajman: same-day delivery is available if the order is received before 4pm. For Al Ain: deliveries are only available during Mondays between 10AM to 6PM. If the order is placed before 8am on a Monday, it can be delivered the same-day. In order to find out about availability of same-day delivery after these hours, kindly call our customer care for assistance or click "Chat Live" for immediate assistance. Yes, we offer an anonymous delivery option as well. In the event that the recipient does not want to accept a gift anonymously the gift will be returned to us. If same day, delivery charge is AED 49.99 for timeslot 6PM to 9PM. All our gift deliveries are made by our trained shipping crew. Certain non-perishable items like perfumes may be delivered by logistics companies such as FEDEX or DHL. All gourmet products are prepared fresh every morning. The items are delivered in temperature controlled vans to ensure that everything is delivered in pristine condition. If you’re unsatisfied with a delivered product, kindly contact customer service and we’ll be happy to rectify the situation at the earliest. If the recipient is not available at the time of delivery, the sender will be contacted and a second delivery attempt can be made either on the same day or the next business day. If you’re ordering chocolates, or other edible gifts, rest assured that all items are prepared again the next morning to maintain freshness. Your satisfaction is guaranteed! Internationally, we can deliver certain products to over 44 countries around the world. Please contact customer service for assistance with international orders. Certain products can be delivered to over 44 countries worldwide. In order to find out more about international deliveries, kindly call our customer care for assistance (Call Us (UAE): (04) 224 8800) or "Chat Live" with one of our chat representatives for immediate assistance.Certain items can be shipped internationally. Yes, the minimum value of an order is AED 99 (US $27). How do you guarantee the freshness of bakery or that chocolates will be delivered in good condition? All cakes, and perishables are prepared fresh every morning, and delivered in temperature controlled delivery vans to guarantee that they’ll make an impression.